Denim on denim is huge this season. Whenever a trend comes back, there is always a modern spin on it and this trend is no exception. Denim is no longer just for casual, it's more versatile than every before. 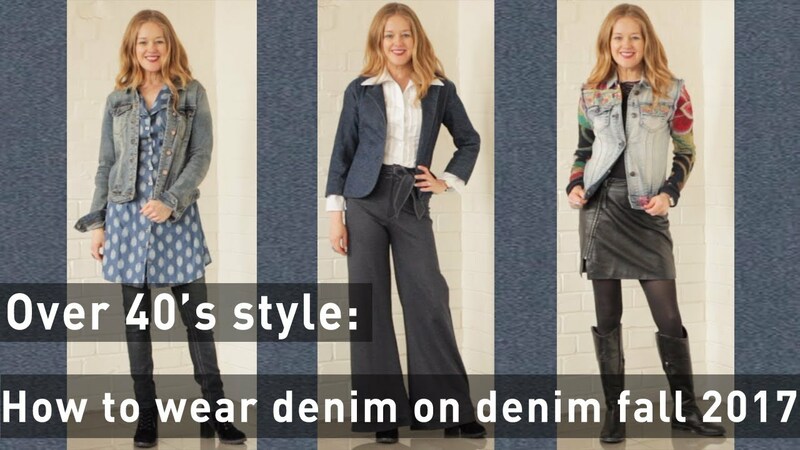 Here are some ways to wear the denim on denim trend in a modern and contemporary way. Denim is huge this season. In this video I am going to show you how easy it is to wear for women over 40. Whenever a trend comes back… as they do, there is always a modern spin on it and this trend is no exception. Denim is no longer just for casual. In fact you will even see suits in denim now. It’s that versatile. All out and layer various denim pieces. When mixing denim with denim, you can wear various shades. This works well as often you will seldom find an exact match. Dress up denim - wear denim pants instead of jeans with a fitted button down and heels. Add a textured denim blazer or simple jacket. Wear one denim piece at a time. Wear a denim jacket with a dress or skirt instead of just wearing jeans. Or wear your jacket as a top and layer with a coat or jacket for cooler days. In this video you will get fashion tips for women over 40 on how to wear the fall trends 2017, 2017 fall outfit ideas for women over 40, denim on denim outfit ideas for women over 40 to create a fabulous over 40 style.